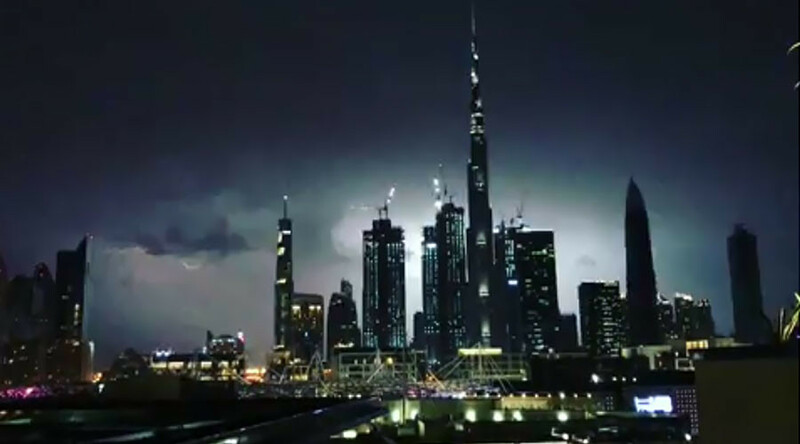 A bolt of lightning struck the spire of the world’s tallest building, the Burj Khalifa, during a major thunderstorm in Dubai, in a stunning moment caught on camera. Reaching a total height of 829.8 meters (2,722ft), the tallest structure in the world towers over the United Arab Emirates city of Dubai, which was hit by a thunderstorm on Saturday. Residents in neighboring skyscrapers managed to catch the phenomenal storm and the jarring moment that a lightning bolt struck the 4,000 tonnes of steel. Luckily, the building has a highly advanced lightning deflection system. When the Burj is hit by lightning, the electrical discharge is drawn to its central spire to protect the main structure.